Certain savory and sweet foods, such as cheese and chocolate, seem to inspire cravings. So, I thought, why not combine the two. Today marked the beginning of Chocolate and Cheese Theme Week. Blue cheese offers a distinct salty, acidic, flavorful bite that complements chocolate nicely if the blend is well crafted. And Rogue Creamery (Central Point, OR) offers some great blue, and other, cheeses as a starting point. (Rogue Creamery's next door neighbor, Lillie Belle Farms, makes a blue cheese (chocolate) truffle, which I had the chance to re-taste last month.) 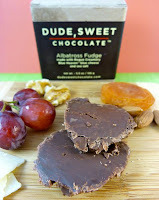 In both today's Dude Sweet Chocolate fudge, and Lillie Belle's truffle, the combined flavors were fun and intriguing. "Great as a griddled sandwich and cappuccino as a dessert, pinot noir, chardonnay"